Paris may be world renowned for the priceless works of art that reside in museums like the Louvre, but we will show you the artwork of the people. Hit the Parisian backstreets and alleys with us as we explore the underground street art culture in Paris. 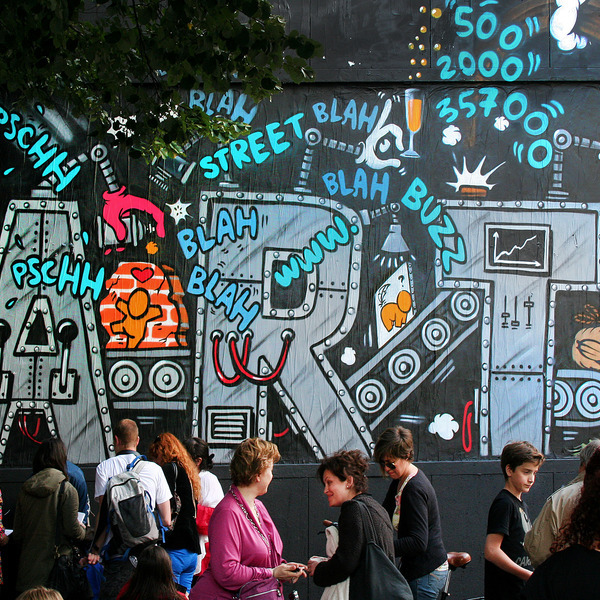 Our guided tours will visit the main street art and graffiti zones in the north-east of Paris where we will visit a street art graffiti gallery, meet the artists in person, and have the opportunity shop for artwork at affordable prices. The Belleville public street art tour runs EVERY SATURDAY AND SUNDAY at 11:00. The meeting point for this tour is Ménilmontant metro station, 139 Boulevard Ménilmontant, 75011 Paris. The tour finishes close to Belleville metro station (lines 2 and 11). Please note: If you are not able to attend the public tour on a Saturday or Sunday we can arrange a private tour just for you! Get in touch and we can work out a time that suits you best. Our tour guide did a wonderful job - when a great guide combines passion with knowledge you can't help but become immersed in the educational experience. The walking tour was 2.5 hours long and I wouldn't have minded if it was twice that long.